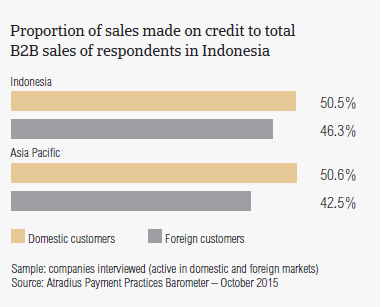 94.6% of the survey respondents in Indonesia reported having extended trade credit to their B2B customers in 2014. This response rate, which is in line with those observed in China and Taiwan, is higher than the Asia Pacific average (91%). This indicates that B2B customers of respondents in Indonesia are more likely to receive trade credit than B2B customers of suppliers in a number of other countries in the region. Consistent with the regional pattern, businesses interviewed in Indonesia appear to be more inclined to sell goods or provide services on a credit basis to domestic than to foreign B2B customers. While the domestic figure (50.5% of the total value of local B2B sales) is in line with the regional average (50.6%), the foreign average (46.3%) is slightly above that of Asia Pacific (42.5%). With the exception of Australia, this inconsistent perception of payment default risks arising from domestic and foreign B2B trade is common across the countries surveyed in Asia Pacific. Over the past year, the average proportion of domestic B2B sales on credit in Indonesia remained substantially unchanged. This is in contrast to the average 3.2 percentage point increase recorded in the region. Sales made on credit to foreign B2B customers, however, ticked upward notably, by an average of 8 percentage points. On average there was a 5.5 percentage point increase in Asia Pacific. Domestic B2B customers of survey respondents in Indonesia were offered, on average, 35 days from the invoice date to pay, the same credit terms as foreign customers. The average payment term for Asia Pacific was 33 days. Additionally, the average payment term recorded in Indonesia is the second shortest term in the region, after that observed in Australia. Compared to the same survey period one year ago, both the domestic and foreign average payment terms in Indonesia decreased notably (by an average of 10 days). Over the past year, 95.4% of survey respondents in Indonesia experienced late payment from B2B customers, more than most of their peers in other countries in Asia Pacific (90.2%). This is the second highest response rate in Asia Pacific, after that of India. Late payment from domestic B2B customers was experienced more frequently than from foreign customers. This has translated into an average of 42.9% and 39.3% of the total value of domestic and foreign invoices respectively, which remained unpaid at the due date. It is worth highlighting that although more respondents in Indonesia than in Asia Pacific experienced late payment from customers, the average total value of overdue invoices in the country is lower than that of the region (44.8% domestic and 45.2% foreign). This holds true particularly as far as foreign invoices are concerned. The various reasons for invoice late payment from customers will be commented on further in this report (see below ‘Key payment delay factors’). 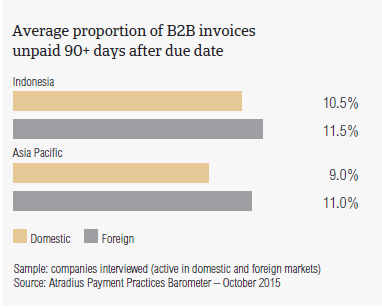 B2B receivables which remained unpaid 90 or more days past the due date average around 10% of the total value of Indonesian respondents’ B2B invoices. This rate is consistent with that of Asia Pacific. The proportion of long outstanding receivables from domestic B2B customers of respondents in Indonesia is almost equal to that from customers abroad. This is in contrast to the survey pattern. Invoice late payment in Indonesia is reflected in the DSO figure posted by respondents in the country. This averages 32 days (lower than the 35 days average for Asia Pacific) and it is the second shortest in the region, after that observed in Australia (averaging 18 days). This finding is consistent to what was observed earlier on in relation to the payment terms offered to B2B customers by respondents in Indonesia. This finding suggests that, on average, businesses interviewed in Indonesia, and other countries with a relatively low DSO, receive payment of a larger percentage of the value of receivables sooner enabling them to convert sales into cash faster. However, as we indicate further in this report, the average payment duration in Indonesia has increased over the past year and this means that there is a higher exposure to the risk of customers’ payment default. Domestic B2B customers of respondents in Indonesia make their past due payments, on average, 27 days after the due date. Foreign overdue invoices are paid by customers within an average of 23 days past the due date. While domestic payments seem to be made within a similar time from to the 25 day regional average foreign payments are made faster than domestic payments and faster than the regional average which at 28 days is longer than the average for domestic payments. More specifically, this means that B2B suppliers in Indonesia receive payment on past due domestic and foreign B2B invoices, on average, around 52 days after invoicing. Over the past year, the average domestic and foreign payment delay in Indonesia increased notably (by an average of 10 days). Due to this increase, businesses interviewed in Indonesia have to wait one week longer than in 2014 to get paid for overdue invoices. The various reasons for customers’ slow payment will be commented on further (see below ‘Key payment delay factors’). Receivables which were defaulted on exacerbate the liquidity position of a business, as following up activities to collect them cost time and money. These may negatively impact cash flow and the business’ profitability. This may explain why notably more respondents in Indonesia, than in Asia Pacific, consider the collection of outstanding invoices to be the biggest challenge to business profitability in 2015 (15.3% of respondents in Indonesia, versus 9.8% in Asia Pacific). This response rate is the second highest in the region, after that of India. Moreover, it is in contrast to the average response of most of the countries in Asia Pacific, which consider cost containment to be the biggest challenge to profitability in 2015. Half of the respondents in Indonesia (50.5%) reported that late payment from domestic B2B customers was most often due to their liquidity constraints. This is above the 46.3% average recorded in Asia Pacific, and is likely to reflect a still challenging business climate. The second most often reported reason for late payment from domestic B2B customers in Indonesia is the complexity of the payment procedure (34% of respondents, versus 28.9% in the region). 30% of respondents reported that payment on domestic B2B invoices is received late due to the formal insolvency of the buyer (respondents in Asia Pacific: 21.4%), and to the circumstance in which outstanding receivables are used as an alternative source of short-term financing (respondents in Asia Pacific: 29.6%). The complexity of the payment procedure is the most often cited reason for late payment from customers abroad (50% of respondents in Indonesia, compared to 39.4% in Asia Pacific). Just over two in five respondents in the country (versus 29.2% in the region) reported that foreign customers paid invoices late most often due to the inefficiencies of the banking system. The third most frequent reason for slow payment from foreign customers is disputes over the quality of goods or services provided (cited by around 30% of respondents, versus 28.3% in the region). The longer an invoice remains unpaid the more likely it is to be uncollectable and written off as a bad debt, worsening the liquidity position of a business. In Indonesia, the proportion of B2B receivables written off by respondents as uncollectable averages 2.2% of the total value of B2B sales on credit. This is above the 2.0% survey average. Consistent with the survey pattern, domestic write-offs outweigh foreign ones. Domestic and foreign uncollectable B2B receivables were reported to chiefly stem from the construction, consumer durables, and services (financial, business and overall services) sectors. For most of the respondents in Indonesia (67.1%), B2B receivables went uncollected due to the customer going bankrupt or out of business (respondents in Asia Pacific: 54.4%). 44.3% said that B2B receivables were written off as uncollectable because the debt was too old (32.6% of respondents in Asia Pacific). According to 41.8% of respondents in the country, versus 35.5% in the region, receivables were written off as the customer could no longer be located. Survey respondents in Indonesia reported having granted trade credit mainly to B2B customers belonging to the chemicals, construction, construction materials, consumer durables, electronics, food, metals and services (financial and business services) sectors. The longest payment terms, averaging 30 days from the invoice date, were given to domestic and foreign B2B customers in the construction materials and metals sectors. In spite of being given the most lenient terms, Indonesian respondents’ domestic and foreign B2B customers in the construction materials sector generate the highest levels of late paid invoices (around 50% of the total value of B2B invoices was classified as overdue). In this sector, the average payment duration on overdue domestic invoices is 43 days, and on foreign invoices 54 days. For the majority of respondents in Indonesia (three in five), domestic B2B customers in the chemicals, construction and consumer durables sectors delay invoice payment most often due to liquidity issues. Foreign B2B customers in the food sector delay invoice payment most often due to the complexity of the payment procedure (67% of respondents). Fewer than 15% anticipate no significant variation in the payment behaviour of their domestic customers over the coming 12 months. At the same time, one in four expects a worsening, most likely in the electronics and metals sectors. An improvement in domestic payment behaviour, mainly in the construction and construction materials sectors, is expected by three in five respondents in the country. Almost the same percentage of Indonesian respondents anticipating no change in domestic customers payment behaviour has the same opinion about foreign customers. 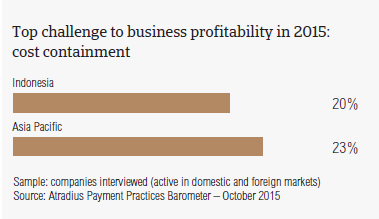 35% of respondents in Indonesia expect no change in the payment behaviour of foreign customers. One in five anticipates deterioration, particularly in the construction materials, electronics, food and metals sectors. Three in five respondents expect an improvement, across all of the industries to which their foreign B2B customers belong.